For many students and teachers, the hassles of traditional computing often prevent them from making the most of technology in the classroom. Schools that have adopted Chromebooks, however, have been able to bring the web’s vast educational resources—whether it’s conducting real-time research or collaborating on group projects—right into the classroom. Chromebooks are fast, easily sharable, and require almost no maintenance. Today more than 1,000 schools have adopted Chromebooks in classrooms, including some school districts like Richland School District Two (S.C.), Leyden High School District (Ill.), and Council Bluffs School District (Iowa) who have deployed Chromebooks to tens of thousands of students. To help budget-strapped classrooms across the country, we’re working with DonorsChoose.org, an online charity that connects donors directly to public school classroom needs. For the holiday season, teachers can request the Samsung Series 5 Chromebook—the most widely deployed Chromebook in schools—at a special, discounted price of $99 including hardware, management and support. If you’re a full-time public school teacher in the U.S., visit DonorsChoose.org and follow the instructions to take advantage of this opportunity by December 21, 2012. Your request will be posted on DonorsChoose.org where anyone can make a donation to support your classroom. When you reach your funding goal, you’ll receive your Chromebooks from Lakeshore Learning, DonorsChoose.org’s exclusive fulfillment partner for this program. If you’re not a teacher, please share this opportunity with the teachers who have made a difference in your life! 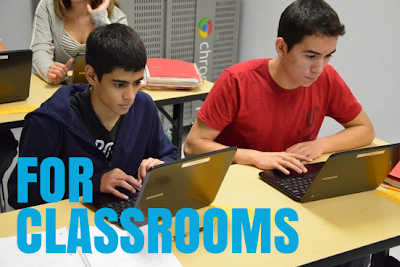 Or if you’re interested in supporting a classroom directly, read through the list of Chromebook projects and donate what you can. Be sure to check back often for new projects. Thank you for your support in giving the gift of hassle-free technology to teachers and students. Working together, we can ensure “The virus ate my homework” is never uttered in a classroom again, and we can help classrooms get off to a strong start in the New Year!